You’d be hard pressed to meet a dedicated Christian who doesn’t say the greatest work on Earth is evangelization. But, while all of us give lip service to evangelizing and discipling, the effect of our labor seems woefully behind. Somewhere there is a disconnect between the priorities we claim and the actions we practice. Something is broken—or maybe just out of commission.This book is an invitation to “look under the hood”—to examine why we don’t witness for Christ as we should, why our local churches are neglecting soulwinning and discipleship, and how we can get back to making Christ’s last command our first priority.Written for every Christian who desires to obey the Great Commission of Christ, this comprehensive volume is motivational and practical, diagnostic and corrective. Whether you are new to evangelism or an experienced soulwinner, Out of Commission will challenge and equip you to share your faith and more effectively reach your community for Christ. You’d be hard pressed to meet a dedicated Christian who doesn’t say the greatest work on Earth is evangelization. But, while all of us give lip service to evangelizing and discipling, the effect of our labor seems woefully behind. Somewhere there is a disconnect between the priorities we claim and the actions we practice. Something is broken—or maybe just out of commission. 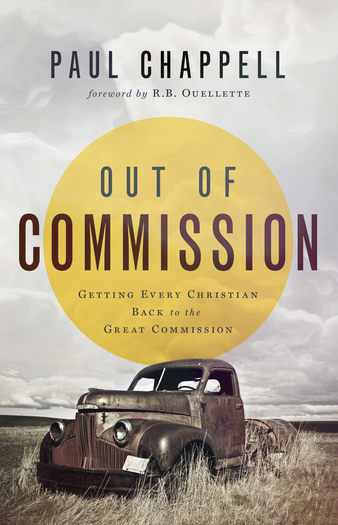 This book is an invitation to “look under the hood”—to examine why we don’t witness for Christ as we should, why our local churches are neglecting soulwinning and discipleship, and how we can get back to making Christ’s last command our first priority. Written for every Christian who desires to obey the Great Commission of Christ, this comprehensive volume is motivational and practical, diagnostic and corrective. Whether you are new to evangelism or an experienced soulwinner, Out of Commission will challenge and equip you to share your faith and more effectively reach your community for Christ.